We have been instrumental in providing boroughs with new powers to tackle nuisance behaviours relating to local environmental quality. Powers to attach street signs and lampposts to buildings. Powers to recover the costs of damage to highways if caused by building works. Powers relating to enforcement of builders skips. Creation of an offence of interference with a barrier, for example on a gated road. Powers relating to the installation of electric vehicle charging points. Code of Practice relating to attaching street signs and street lamps to building. Information about penalty levels for builders skips enforcement can be found here. Best practice on tackling damage to highways can be found here. The London Local Authorities Act 2007 contains several provisions allowing London councils to tackle flyposting, graffiti, littering and abandoned vehicles. More detailed information on this Act can be found in our Rough Guide to the London Local Authorities Act 2007. We refreshed the content in June 2015 to bring it up to date. The prevention of persistent unauthorised advertisements (section 11). Dealing with appeal provisions to flytipping (section 25). The 2007 Act introduced a decriminalised enforcement regime in London for littering from vehicles and offences relating to waste receptacles. Littering from vehicles: Enabling councils to serve a penalty charge notice on a vehicle owner when a littering offence has been committed by somebody inside the vehicle. Buses, coaches, taxis and private hire vehicles are exempt. 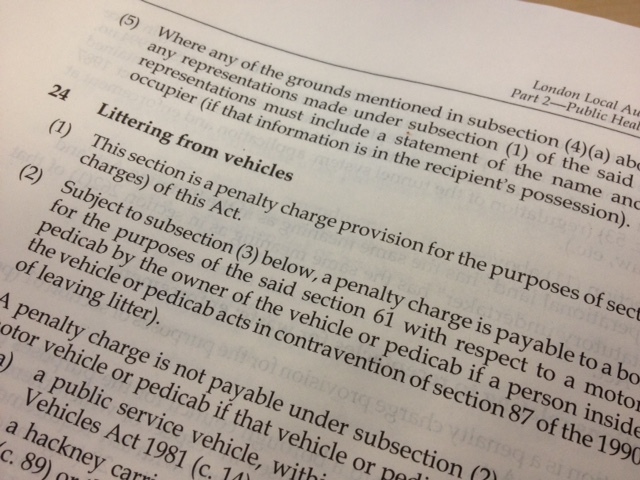 We have produced a Good Practice Guide on these provisions: Provisions on the Penalty Charge Notice in relation to littering from vehicles. Waste receptacle related breaches: Allowing councils to set standard regulations for businesses about rubbish collection, including where to place bins and what to put into different recycling containers. Councils are able to impose a penalty charge on those who fail to comply. The government's Deregulation Act 2015 made changes to these powers from 15 June 2015. More information can be found here.